Q1: Does the tuition fee of 1,580 USD cover accommodations and meals? A: The tuition fee includes lunches, but accommodations are not covered. MTC does not offer accommodation services. The tuition fee covers the expenses derived from the activities between 9:00 a.m. ~ 3:00 p.m., Monday to Friday. For safety reasons, it is suggested individual applicants stay with family, or stay at a recommended location with their parents. Q2: Does the tuition fee of 1,580 USD cover tour expenses or insurance? A: Yes, lunches, textbooks, tutors, half-day trips, administration fees, and traveler accident insurance for the entire duration of the summer camp is covered. Q3: Does the tuition fee of 1,580 USD cover airport pick-up service? A: MTC doesn't provide airport pick-up service. Q4: Is airport pick-up service provided for individual students? A: If you need an airport pick-up service, the MTC can recommend a number of airport limousine pick-up services. Please note that this service is not covered by tuition fees. Q5: How do you place students in classes? Will it be appropriate for my children's Chinese proficiency level? A: The placement test, student orientation, and parent conference are held on the first day of each session (6/17, 7/15, 7/8.) Students are placed into a suitable class based on their Chinese proficiency level and age. Each age group is divided into five levels. The Program is designed for students whose Chinese is a second Language. If your child is a local student or his/her four skills (listening, speaking, reading, and writing) are approximately native level, we suggest he/she to apply to programs for local students. Q6：Should my child attend class when a typhoon strikes? Are there any make-up classes? A：No make-up class will be held and no refund will be made for course cancellation due to force majeure (such as typhoons or natural disasters.) Class cancellations follow announcements made by the Taipei City Government. Q7：Is it necessary to participate in the field trips? If an activity is cancelled due to force majeure, is it possible to postpone it? Q1: The summer camp times do not fit my schedule. Can my child join the class midway? A: MTC Summer Camp upholds a standard for its education norms and quality. ALL STUDENTS ARE REQUIRED TO ATTEND THE ORIENTATION AND PLACEMENT TEST ON THE FIRST DAY OF CLASS. Students may leave the camp early as a result of schedule conflicts; however, students are NOT allowed to join the class midway through. This policy is set to ensure the teaching quality demands of other students and parents will not be compromised. Q2 : If our schedule changes and we are unable to attend the whole duration of the camp after having completed the registration, is tuition refundable? Condition 1: 90% of the tuition fee will be refunded for applications submitted before the first day of the program. Condition 2: 50% of the tuition fee will be refunded for applications submitted before 1/3 of the program has been completed. Condition 3: No refunds will be given for applications submitted after 1/3 of program is completed. Refunds will not be processed until the end of August. Q3. What information should I fill out in the on-line application? A. Student's name, birth date, passport number, parent/guardian contact information(email account, phone and cell-phone numbers, fax number, address) , emergency contact in Taiwan, diet and learning special needs, self-evaluated Chinese proficiency, mental and physical health status, payment method (US dollars or NT dollars). Q4 How should I pay the tuition? A: You can pay the tuition fee in NT dollars or in US dollars by bank wire transfer. After you complete the registration form online, an auto-reply email listing the MTC account will be sent to you. Registration is accepted only after you have completed the following registration procedures detailed in the auto-reply email by the deadline. Otherwise, your seat will be opened to waiting list applicants. Attention: Tuition paid in USD can only be wired to the indicated NTNU USD account and tuition paid in NTD is to be transferred to the indicated NTNU NTD account. Q5. How is my application coming along? When will I be contacted about my application? A: We will show all the applicants' application progress on “Application Status” of our website and update it at 10 am (GMT+8) from Monday to Friday. Please note it usually takes 1-2 days to process due to the time-difference. For privacy concerns, we only post the APPLICATION NUMBER which you receive from the on-line application system and when you have finished applying. If you have completed the application process, you will receive the Confirmation of the Registration Completion. In May 2019, we will send you the Camp Information Package. Q1: How are the meals are served at the camp? Do you offer special meal catering for specific dietary needs of students (such as vegetarian, no beef, pork or seafood...etc.)? A: The lunch meals served by MTC are Chinese style lunch boxes, Taiwanese style local food, or Western light meals. The meals are chosen with concerns for nutrition, cleanliness, and children’s preferences. Please mark your special needs in your application. Q2. Is drinking water provided? A: There are water dispensers at school. Students may bring a water bottle for drinking. Q3: My child is very picky about food at home. I am afraid s/he may not be used to the meals served by the camp and not eat. A: The quantity of each meal will be adjusted based on each day's physical activity level. Each meal must be sufficient, nutritious, and tasty. We also try to promote good dietary habits and teach children not to eat junk food. 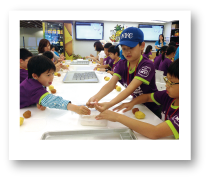 For students who are picky eaters, we encourage him/her to finish the meals we serve. You can also choose to prepare lunch for your child, but there will be no fee deduction provided. Q1. How are summers in Taiwan? Do we only need to bring summer clothing? A: The average summer temperature in June and July is around 35 degree Celsius. In addition to packing summer clothing, we suggest you to bring one or two thin long-sleeve coats or shirts, which your child may need in air-conditioned indoors and protect him/her from sunburns. Also, you may ask your child to bring an umbrella or raincoat with him/her for occasional rainy weather. Q1. Do you provide accommodations? A: Mandarin Training Center DOES NOT provide accommodations for students. Due to safety concerns for your child, we recommend to arrange for your child to stay with relatives or friends in Taiwan. Or, you may consult the Recommended Accommodation List, and contact the nearby hotels or hostels with convenient transportation. Q1. How to get to the Mandarin Training Center at NTNU? MRT: Take Songshan-Xindiam Line、Zhonghe-Xinlu Line and get off at Guting Station. Take the Exit 5, and walk straight for 5~8 minutes. Bus: Take bus 3、15、18、74、235、237、672、He-ping Line, and get off at the stop-"Shida(National Taiwan Normal University)"or "Shida 1"
Q2. How do you arrange the transportation for the field trip days? Do we need to pay fares for transportation? A: We hire buses and use public transportation on field trip days. The expenses and fares are covered by the tuition. Counselors accompany children on all the trips to watch over them. Buses are hired from a registered bus company which is contracted by MTC as a regular service. All buses are owned by the company and all meet the standard of government safety regulations. Passenger insurance is legally required. Moreover, service years of all buses do not exceed five years. Bus models will be adjusted based on the number of participants.